The digital photography obtained during these travels around the United States will be used to document the reality of this permanent disability, the methods survivors use to adapt to it, and the scars it leaves behind. A personal interview and digital photo of the survivor will also be used as reference material to create a graphite on paper conceptual portrait depicting the humanity which still resides within the "patient". These portraits will be completed using the Ostrich Cot and other Arachnoiditis-friendly Reasonable Accommodations implemented at SheilaLynnK Art Studio. 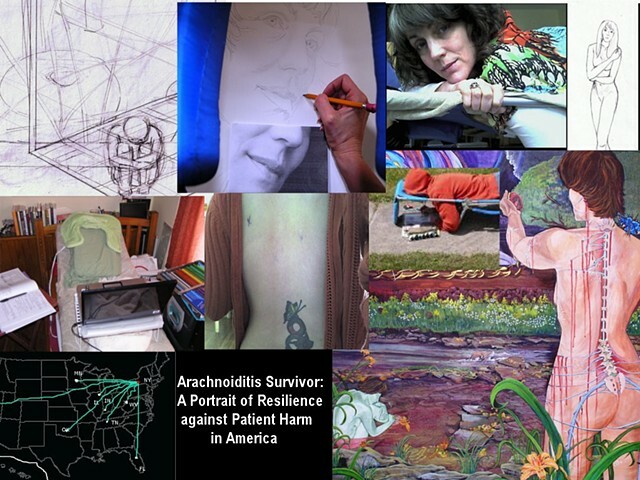 This collection of portraits will then be paired with the digital photographs to be shown in an exhibit dedicated to Arachnoiditis Awareness and Prevention. Each Survivor Volunteer will receive a Signed Print of his/her Conceptual Portrait to keep. Arachnoiditis Survivors are not expected to finance this project. The AIM|Hatchfund Campaign in June 2014 met the revised $2500 minimum goal.This Funding will cover the cost of supplies & materials for Portraits and the Arachnoiditis Art Exhibit.Additional funding will increase the reach of this project. Buy a Survivor Project T-Shirt now available at See.Me. $32 Full color, both sides. $6 of each purchase guaranteed to benefit Art For Arachnoiditis.